Research is the first step to purchasing your own classic car, and ultimately you’ll want to know what the car of your dreams is worth. There’s a wealth of information available on the subject of classic car prices, especially on the internet, and knowing how to navigate the available price guides is a valuable skill that is easy to master. Arriving at a price for a collector car requires that you have some idea of its condition. Last week, we discussed how to use certain features of a car to understand which condition class that car would fall into, and that information will serve you now when consulting a price guide for information on the vehicle’s value. Like any collector market, prices are decided by how much people are willing to pay for a particular item of a certain condition at a given time. Over the course of many years, prices may fluctuate for a number of reasons, and the easiest way to determine what people are willing to pay for a particular car is to turn to the most recent auto auctions. Big ticket auctions like the Barrett-Jackson and Mecum are diversely populated with a wide range of cars, usually in Class Three condition or better. Looking to recent auction results to price a car in Class Three, Two or One is very reliable, as long as you can be sure that the car you’re looking at is in a similar condition. Either have a firm understanding of the condition classes, or trust a professional to do it for you. Cars On Line provides an Inspection and Appraisal Service to help you understand the condition the car you’re looking at is in. If you know the condition of the car, attending the auctions yourself and compiling closing data to find what the car is worth probably isn’t practical on a car by car basis. Luckily, many respected price guides send representatives to these auctions to do the math for you. Price guides like Sports Car Market and High Bid attend the auctions, assess the vehicles on the block at popular auctions and publish the compiled closing results. You can see their data published in price guides, available in a subscription format, as digital publications and sometimes in print. In most cases, they’ll take the data and arrange it by year, make and model. Each car will have values listed for the six condition class categories. 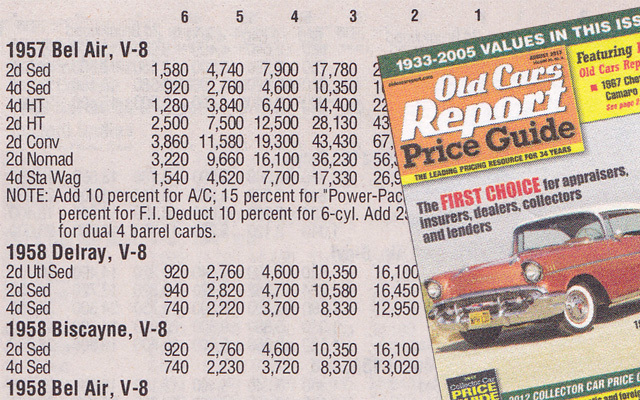 See the graphic above for a sample of how Old Cars Report arranges their price guide. Cars On Line publishes information about the collector car market at regular intervals using price guides like Sports Car Market and High Bid to compile the information. Old Cars Report Price Guide publishes a printed bi-monthly magazine with very accurate data for some of the most commonly sold classic cars. These are only a few examples of a variety of price guides out there, with many more available online or at your local newsstands. Not every price guide offers the same kind of information. Cars On Line published a price guide following the 2013 Barrett-Jackson Auction that featured a “Hot List” of cars from the auction. Click here to read it! We compared results from 2012 to 2013 and noted trends in the current market. A guide like this will help you understand some of the most current prices on certain cars, but is highly sensitive to local fluctuations. Knowing that the current market is down using a guide like this could help you save a lot of money! If the market is expected to recover, consulting an additional guide that averages prices over longer periods of time will give you a better idea of what your new purchase will be worth to you in the future. Consulting multiple price guides and noting the average will be the best way to arrive at the fairest price. There are a number of factors that went into the price in the window of the car you’re looking at, and the suggested market value found in a classic car price guide will likely be among them. You’ll want to put yourself in the best position for purchasing a car by arming yourself with as much information as possible. Price guides and inspections are among the best ways to do that. The above story has been brought to you by United Routes Auto Transport. If you want your classic car delivered with no hidden fees, contact United Routes. They are dedicated to exceeding your expectations.